His unique voice ushered in the 90’s and survived throughout the 2000’s. You’ve stomped and clapped with “We will Rock You” in sports arenas and you may have even attempted the highs and lows of “Bohemian Rhapsody” on a karaoke night. I am of course talking about the voice of iconic Queen front man, the late great Freddie Mercury. For decades no one could replace him, until Roger Taylor of Queen, launched a talent search looking for vocalists and musicians to star in “The Queen Extravaganza” tribute tour. Eager hopefuls immediately started uploading their audition tapes to YouTube for a chance to tour with the band. It was that very week near the end of September when the web went ablaze with uploads from countless Freddie Mercury impersonators. One person who decided to submit a video was Christian rock band Downhere’s Marc Martel. Originally hailing from Canada, (now living in Tennessee), Martel has been the lead singer of the his band for the last 10 years. The audition video itself appears unexceptional. Martel films in a messy studio space. He’s holding a mic and introduces himself as Marc Martel doing his “Somebody To Love” audition. He pushes the play button to his backup music. Then, when he starts singing, you hear what seems to be Freddie Mercury’s voice coming from this guy’s mouth. Since September Martel has been winning Queen lovers all around the world. His audition video now sits with over 4.5 million views and, after having made it to the public voting round of the talent search, has a clear shot of winning the competition. We got a chance to talk to him as he wraps up his album tour before he heads back up to Canada for the “How Many Kings” Christmas musical tour. Were you expecting your audition tapes to do that well? You’re coming up to 5 million views. It’s very amazing. Every now and then I have to remind myself though that Justin Beiber has hundreds of millions of views. Nobody expected it … It is absolutely mind-boggling how something like that can just take off and especially since people have been telling me that I sound like the guy for years. I didn’t realize that people really cared that much you know? It was like never that big of a deal, but I guess it is. It’s awesome. Were you a fan of Queen before? Is that your natural singing voice? Or do you mimic others? I’m definitely a mimic naturally but then there are definitely a few other singers I can do fairly well but even when I’m not trying to mimic Freddie Mercury, people always tell me, people at my shows or come see our band [say that] I sound like Freddie Mercury. Even when I’m trying specifically not to sound like him I still get it. [I use] mostly my normal voice but I put it on a little bit when I want to try to sound exactly like him. Your audition tape was so natural and flawless. How many takes did you take? Think I did around 6-8 takes I believe, and that was the last one I did. The first few I did were a lot more animated and I just felt like a bit of a goofball jumping around in my studio and I was like, “You know what? I’m not gonna do that. I’m just going to stand there basically and sing the song and not make a big deal out of it.” And I didn’t make a big deal out of it by not cleaning my studio! So it’s like the real you. Heh heh yeah and I was still kind of doubting myself whether or not I should upload the video because you know, I love what I do with my band. We’ve had a great 10-11 years and I’d love to keep doing this for as long as we can and I was afraid in a way that if I win this it could interfere with my band. There are three other guys’ careers at stake here. You know, if it interferes with that. What would happen then, with your band, if you win or lose? Well the good thing is that if I win, it’s a temporary thing. It’s not like a career thing to be in a Queen tribute band. It’s a tour that’s going to happen next year for two or three months and as far as I know that’s all. And I’ll be able to keep playing with my band. We’re already booking a spring tour next year so we’re still moving along with our band as if nothings really changed. Knowing that Queen was controversial with Freddie Mercury being homosexual, does singing Queen songs harm the Christian-ness of Downhere? We’ve had so much positive feedback from the Christian community. I think people know us, people know our hearts and they know that we’re strong believers and that is the foundational thing, to all four of us, and me included obviously, and I wouldn’t jeopardize that with this and some people have different opinions as to how far a Christian should go.. as far as being in the world and not of it. This tour, this whole thing, when it comes down to it, is a tribute tour for a great band who put out a lot of great music and the reason why its great music is because they said a lot of stuff thats true. And it really resonated with the hearts of millions of people. They’re the second or third most selling band ever. And the reason for that is because not only did they write good music but I think their lyrics, obviously they weren’t coming from a biblical perspective, but I also believe that all truth is God’s truth and when you speak in truth people will resonate with that and want to hear more. And this tour is not about celebrating Freddie Mercury’s personal life decision, it’s not about that, it’s about giving Queen fans something new to cheer about and I can get behind singing truth even if its not proclaiming the gospel, its still truth, and people want to hear that. How does your band feel about your success? Are they jealous? Lastly, can you talk about your dirty ‘stache? You know what? I really wanted to, and I started it, cause we were on the road and I’m like ‘well i got nobody to impress’ So i did have the mustache for about just over a week and then I got home and my wife is unfortunately not a mustache fan at all so as soon as I walked in the door I had to cover my face with my hand and I’m like “Aaah I’m sorry honey I’ll shave it right away” and she’s like “yea you better!” Well it wasn’t very impressive. I think the way to do it is to grow the whole beard out. She can stand the whole beard and then just shave off the beard and leave the mustache so then its actually a real mustache and not just the dirty ‘stache. Strategy. 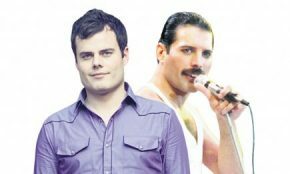 Public voting ends on Monday November 28 so be sure to visit www.queenextravaganza.com to cast your vote for Marc Martel!